The Tampa Bay Lightning have re-signed defenseman Victor Hedman to a five-year contract through the 2016-17 season, Vice President and General Manager Steve Yzerman announced today. "I'd like to thank our owner, Mr. Vinik, and of course GM Steve Yzerman for helping me move forward in my career," said Hedman. "I love it in Tampa Bay with the Lightning and I will do all I can to help this organization be successful on and off the ice." Hedman, 6-foot-6, 229 pounds, has played in 20 games with the Lightning this season, recording two goals. He ranks second on the Lightning in average ice time with 22:55 per game, just five seconds behind team-leader Eric Brewer (23:00), and is tied for second for blocked shots with 40. The No. 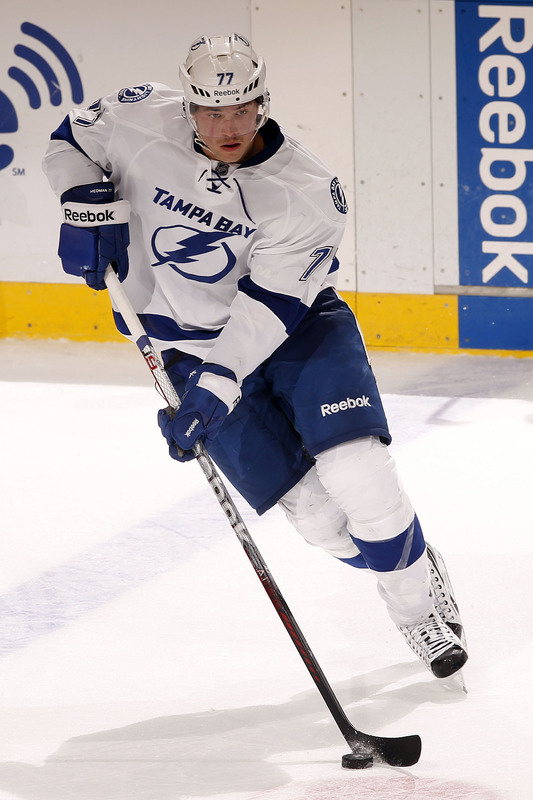 2 overall pick of the 2009 NHL Entry Draft, Hedman, 20, has played in 173 career NHL games, all with the Lightning after coming to North America prior to the 2009-10 campaign. Since that time no other Tampa Bay defenseman has played in more games and recorded more goals (9), assists (39) or points (48). He has averaged more than 20 minutes of ice time per game in each of his three NHL seasons, ranking in the top three or higher on the Bolts in each. Last year Hedman led all Lightning defensemen with 23 assists and was second among team defensemen with 26 points. Hedman was also fourth on the team with a plus-3 rating. A native of Ornskoldsvik, Sweden, Hedman played for MoDo Hockey of the Swedish Elite League before joining the Lightning. In 2008-09 he was named the league’s Rookie of the Year at the age of 18 after making his debut during the 2007-08 season. Hedman has represented his native Sweden in multiple international competitions, including winning the Bronze Medal at the 2010 IIHF World Championships as well as Silver Medals at both the 2009 and 2008 World Junior Championships.